When Almack’s Assembly Rooms, King Street, St. James’s, opened on 13 February, 1765 Horace Walpole wrote: “The new Assembly Room at Almack’s was opened the night before last, very magnificent, but it was empty; half the town is ill with colds.” Apparently, the ton recovered quickly, for Almack’s was soon touted as the epitome of all that was fashionable. 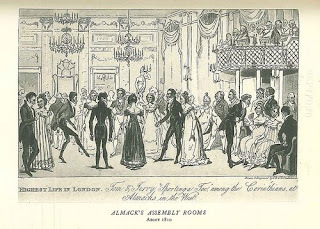 Almack’s boasted three rooms, where, for a subscription of ten guineas, one attended ball and supper each Wednesday evening during the twelve weeks of the London Season. 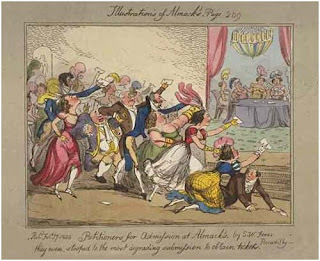 However, before becoming a subscriber, one was first subjected to the scrutiny of the Lady Patronesses of Almack’s, originally comprised of Ladies Pembroke and Molyneaux, Mrs. Fitzroy and Mrs Meynell and the Misses Pelham and Lloyd. Circa 1814, the committee was made up by the Ladies Jersey (Sarah, Countess of 1786-1867), Castlereigh, Cowper (later Lady Emily Palmerston d. 1869) and Sefton, the Princess Esterhazy and the Countess (later Princess) of Lieven. Mrs. Drummond-Burrell (later Lady Willoughby de Eresby) also served briefly. 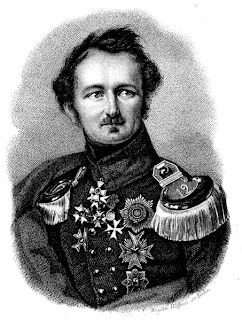 According to Ticknor’s diaries, only one member of the committee acted as Patroness at a time, the post being filled by a rotation system. All ranks, all ages, all sexes.